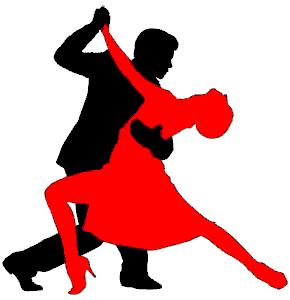 Dancing Argentine tango is basically a matter of improvisation. This is the major difference compared to most other dances which have predictable figures known by both the leader and the follower. In Argentine tango it's all about contact between the dance partners. And even if you make a 'mistake': you just improvise a 'solution' and continue to dance. As a beginner in the Argentine tango you are bound to learn the basic figures as small pieces of choreography. Gradually these pieces will become part of your motor system enabling you to endless variations. Prior to the dance the dance couple engages into an embrace (embraza). The leader offers his left hand and waits for the right of the lady, followed by her left arm. He let her choose the distance. The leader has the lady in his arms as if she were an expensive delicate sculpture. At the same time he makes her feel relaxed by his calm appearance. As many contact points as possible are created by the right arm of the leader and the follower's left arm. A relaxed yet present left arm of the leader holding the right arm of the follower completes a good connection making it possible to follow and respond promptly and clear. The right side of the faces are opposite to each other. If the upper bodies touch each other, it is called a close embrace. A tango couple in close embrace is almost like one body on four legs. If the upper bodies don't touch, it is called an open embrace. Once chosen, the embrace doesn't change during the dance. Both partners should maintain good forward body posture at all times including a degree of tension in the arms and upper body still leaving some freedom of movement. While the upper bodies stay orientated towards each other throughout the dance, the legs enjoy more freedom of movement. Torsion of the spine allows for this. How does a tango dance begin? In order to provide a proper preparative it is convenient for the lady to know by which foot and according to what timing the first step will be taken by the man. The leader indicates this by shifting her weight to either her left foot or her right foot. Weight shifting is initiated by a subtle cadence (in other words: wobbling a bit). The man will lead her first step to be taken with the foot without the weight on at that time, both engaging in a common cadence with the rhythm of the music as a shared experience. Each step is to be executed clearly and precise. Complete each step and transfer weight before commencing the next step. 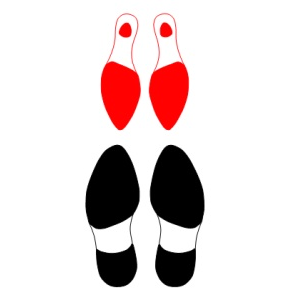 The standardized ballroom tango technique prescribes that steps should be made with the heel of the foot touching the floor first. Argentine tango uses the standing leg to push off, the free leg reaches with almost a flat foot, turned out slightly and inward tilted towards the intended spot on the dance floor. This way you are less likely to shift your weight too early, and it enables you, if necessary, to retract the step. You don't need your arms to dance, except to communicate with your dance partner. If you feel like you have to use your arms to navigate across the dance floor, you're probably doing something wrong. It is sufficient if the leader invites the lady with his torso to take a step in the direction he wants to lead her. And how does a tango dance end? At first you will aim to end in the same position as at the start: 'position cero' (see image on the left). This, of course, depends on the music. After the last note, no more steps are made. But as fantasy serves many creative ending poses will emerge (like the image on the right). Interaction between leader and follower: macho or muse? Various forms of interaction circulate on the dance floor. These forms range from the macho approach (taking the word "leader" the most literally) to the "muse" approach according to which the leader is more of a facilitator. According to the macho approach the man determines 'what' and 'when' and the woman completes "how". A more democratic approach is the lady being the 'muse' of the leader. Muse's signals can vary from subtle suggestions to clear invitations to which the leader can respond by giving room or temporarily being a follower. Mutual sensitivity allows leader and follower to team up together in their shared improvisation. Neither approach is by definition right or wrong. It just depends on what you're most comfortable with in relation to a specific dance partner. Both approaches have the same goal: to let the lady shine on the dance floor and for her to enjoy the dance!